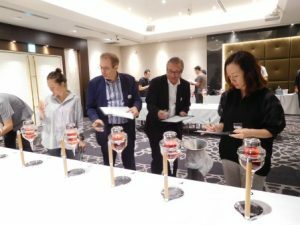 On July 18, foreign faculty members (Akita residents) from “Akita International University” (AIU) challenged “The Qualifying in Akita prefecture” (organized by“Akita Sake Brewers Association”) “38th National sake tasting Championships 2018” !! 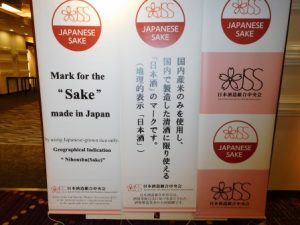 Ms. Akiko Frischhut (German)- a big fan of Akita’s sake, who was awarded 7th place out of more than 60 competitors last year, regretfully could not win a prize this second time. After the competition, she has already committed to come back to win a prize next year. and Mr. Joe Sykes (British) challenged the Qualifying for the first time. They were impressed and a little surprised by the serious atmosphere of the hall and the quiet enthusiasm from the 70 other competitors. 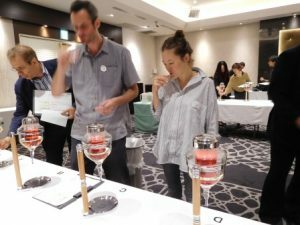 The four faculty members of AIU seemed confident in identifying the quality of the seven types of sake in the first round, but in the second round maintaining their consistency in identifying the same types was extremely difficult as Japanese competitors also felt. At the awards ceremony and the party after the competition, they enjoyed lots of the clearly labeled sake brewed in Akita, feeling exhilarated and a sense of unity among the competitors. Furthermore, they tasted the seven kinds of sake again to review their results with great anticipation for next year’s competition. This concludes the brief report of the exciting “Qualifying of National sake tasting Championships” for AIU foreign faculty. Copyright © Akitano HAKKO All Rights Reserved.